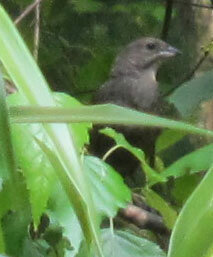 The Brown-headed Cowbird - Molothrus ater - is a bird I have mixed feelings about. Certainly the male with his rich brown head and irridescent feathers is pretty. The grey female is also lovely in her own way. 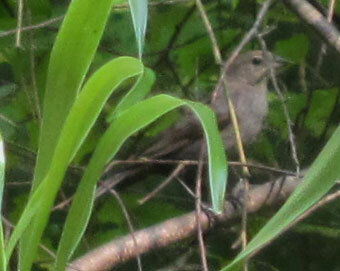 They look like slightly large finches, with the short, pointy beak. However it's their parenting habits that bother me. What they do is, once the female is ready to lay eggs, she flies around looking for a nest. She lays an egg or two into each nest she finds. Then those other birds have to care for the offspring! It can be pretty bad when she lays her egg in the nest of a much smaller host bird. So then you have a little goldfinch desperately trying to feed this giant "mutant baby" that hatches, and it can mean that the mother bird's own babies don't get enough food. But still, this is simply natural for the cowbird to do, and it's hard to fault them for doing what they were genetically programmed to do. 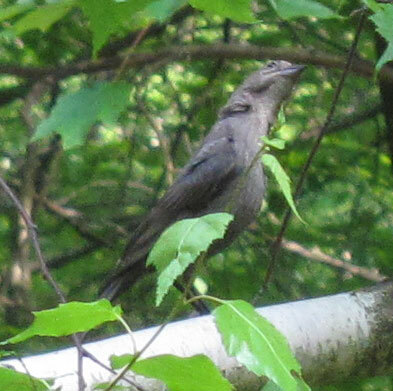 In June 2011 we were watching the phoebes build their next on our back porch light as they tend to do every year. 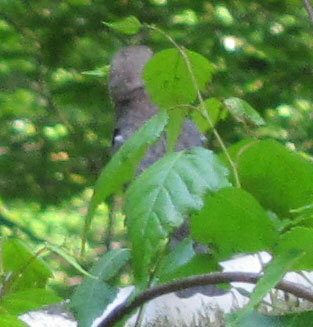 Then I noticed a grey bird lurking nearby. 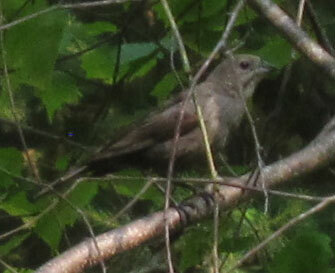 It was a female cowbird! You can even see her, in the photos below, looking up at the nest in curiosity. She watched the phoebes with interest - and when they'd left for a short while, she tried to fly up to the nest! Luckily one of the phoebes was around and immediately drove her away.